Amidst the ongoing international break, Paul Pogba recently caught up with Lionel Messi in Dubai. Pogba, who missed Manchester United‘s derby encounter against City last weekend, was left out of Les Bleus squad, as Didier Deschamps didn’t want to risk the midfielder. That saw Pogba use his holiday time in Dubai. It was during this period when he bumped into Messi and the Argentine’s wife at Salt Bae’s Turkish steak house. One of the topics the duo were seen discussing was regarding French midfielder N’Golo Kante. Pogba, who knows many languages, spoke to Messi in Spanish. 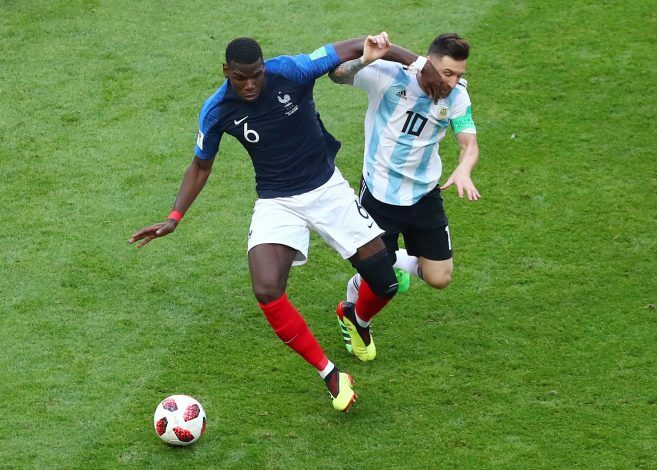 France had beaten Argentina 4-3 in the FIFA World Cup 2018, and that’s when Kante supposedly stopped the magician from weaving his magic. Pogba was also seen enjoying his time with Salt Bae at the steak house, and was in a happy mood. Meanwhile, his French teammates suffered a shock 2-0 defeat to Holland in the UEFA Nations League. Georginio Wijnaldum and Memphis Depay both got on the score sheet for the Netherlands. The win, in turn, saw Germany relegated. France too, are at the risk of elimination, as Holland could progress to next summer’s tournament at the expense of them if they can win their final game.